This year, when anyone asks me how I spent my summer vacation, I get to tell them I saw America or at least seventeen states of it. 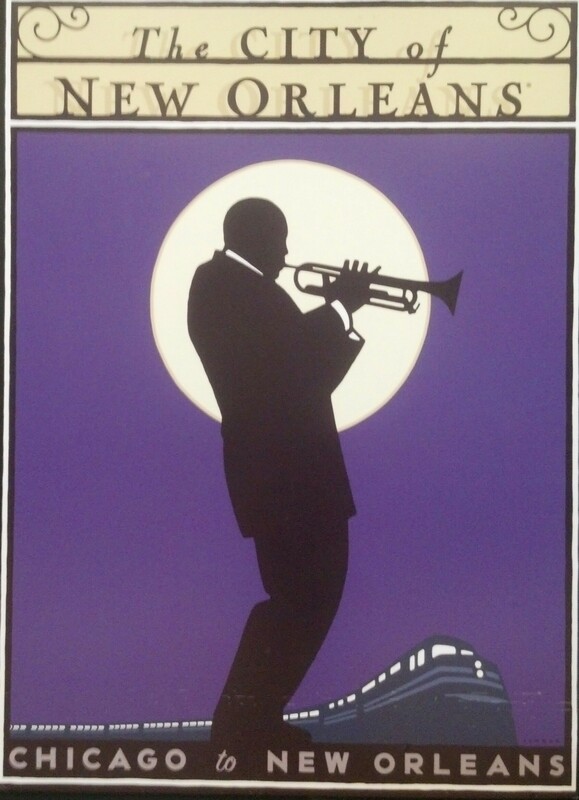 On the afternoon of July 5th, my Mom and I boarded the wonderfully named train the City of New Orleans for the first leg of our vacation loop around the country. This train took us nearly due north to Chicago. We covered five states in twenty hours, getting into the city around 9am. We started our day by walking around the beautiful old Union Station before playing tourist. I went up to the 103rd floor of the Willis (nee Sears) Tower and went out on the Skydeck. This is a clear piece of lucite that hangs out about 4 feet from the building to let you literaly get a bird’s eye view of the city. Mom kept her feet planted firmly on the ground! Once I came back to earth, we wandered into Giordano’s for some deep dish pizza. Happy and full, we returned to Union Station in time to catch our afternoon train. The Empire Builder travels over 8 states as it moves across the top of the country. In Spokane, the train divides in two and half goes to Seattle and the other half goes to Portland. We were originally planning going to go to Seattle and take the Cascades train down to Portland. However, there have been a number of delays recently with all the petroleum products and other freight moving through those states, which meant we had to rebook our travel onto the Portland bound train. Unfortunately, there were no seats on the Portland train from Chicago, so, in Montana, we had to move from one end of the train to the other. We made the move and even got to see the outline of the living glaciers of Glacier National Park before nightfall. The next morning, we arrived in Vancouver, Washington where we detrained to wait for a shuttle to the hotel where the Golden Crown Literary Society Annual Conference was being held on Hayden Island on the Columbia River just a short hop from downtown Portland. While Mom spent her days wandering Portland (seeing the zoo, museums, gardens, and the Mecca that is Powell’s City of Books), I spent mine in workshops, sessions and networking with hundreds of other authors, editors, publishers and readers of lesbian fiction. It was glorious – like attending a reunion of your tribe. There were many new faces and lots of familiar ones as well as plenty of the authors I’ve been reading since I was a baby dyke buying her first lesbian book (Murder at the Nightwood Bar by Katherine V Forrest) at Judith’s Room bookstore in New York City when I snuck away from a Model UN conclave. The special speaker was Ann Bannon, the author of many wonderful lesbian pulp novels which helped so many of our community find a voice. The keynote was done by Lori L Lake, who has written a number of novels and mysteries and has been a wonderful mentor for many of the authors in the room. I did an author chat with Marianne Banks, Jove Belle, Elizabeth Sims and MJ Williamz and facilitated by the wonderful Bev Prescott. I was also on the panel “Eat Your Heart Out – Writing About Food” with Karin Kallmaker, Georgia Beers and R.G. Emanuelle and moderated by the always fabulous Lynn Ames. We let the audience write ingredients down for us to randomly choose three to make into a meal. Mine were lamb, eggplant and peanut butter which is a lot better than Karin’s herring and asparagus, Georgia’s (a vegetarian) bacon and RG’s gummi bears! I’ll post the meal I make soon. My book, In the Midst of Tribulation, was a finalist for a Goldie award and, while it didn’t win, it really was amazing to be nominated and to make it onto the short list. Check there for the other finalists and you’ll see what good company I was in. 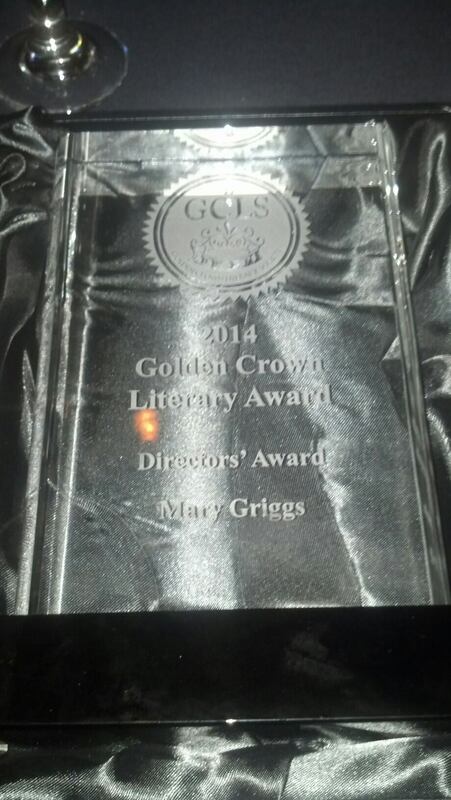 The GCLS board bestowed on me the Director’s Award, which was an incredible honor. I very much appreciate this recognition by the board and am very happy to be a part of this wonderful organization. After the awards ceremony, there was a dance and I danced for a song or two with my girlfriend before calling it a night. The next day was the last day and I had a bit of post con blues. This year’s case wasn’t too bad as the next year’s conference will be held in New Orleans on July 22 to 26, 2015 and I’m chairing the host committee to organize it. I was pleased with the number of people hugging me and promising to be there. Look for more info soon – including more about our special speaker, Ali Vali, and our keynote speaker, the incomparable Dorothy Allison. Also, I got to spend a day in Portland visiting Powell’s bookstore. Can I just say I was happy to see my books on their shelves? I signed them and put them back on the shelf and my smile didn’t dim for hours. The next morning, my mom and I even made a return visit to Powell’s to get more books shipped back home before getting to the train station. 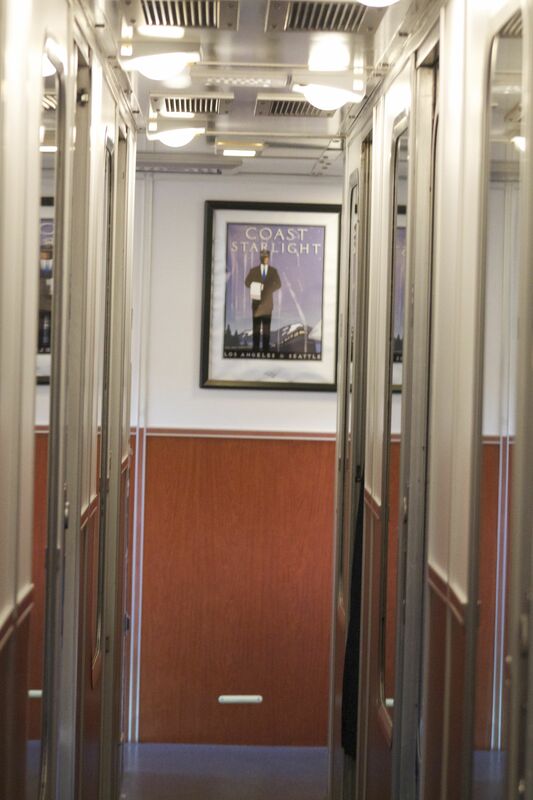 This train was the Coast Starlight to take us down to Los Angeles. On board, we found there was a special lounge car for those in sleeper seats with wifi and comfy chairs. I loved being able to travel along the state of California’s salad basket and along the coast, too. Because of track troubles, we had to a take a bus to Eugene and because of an incident with the northbound train, that train was a little over two hours late. We finally reached our hotel after midnight. The next morning we went to the La Brea Tar Pits and the Page Museum (which should actually be called the La Brea Asphalt Pits but that just doesn’t have the same catchet). Seeing the bubbling methane and the gumbo of bones they’ve unearthed was amazing and I highly recommend a visit there. Afterwards, we went over to Roscoe’s House of Chicken and Waffles for a delicious lunch of, you guessed it, fried chicken and waffles. 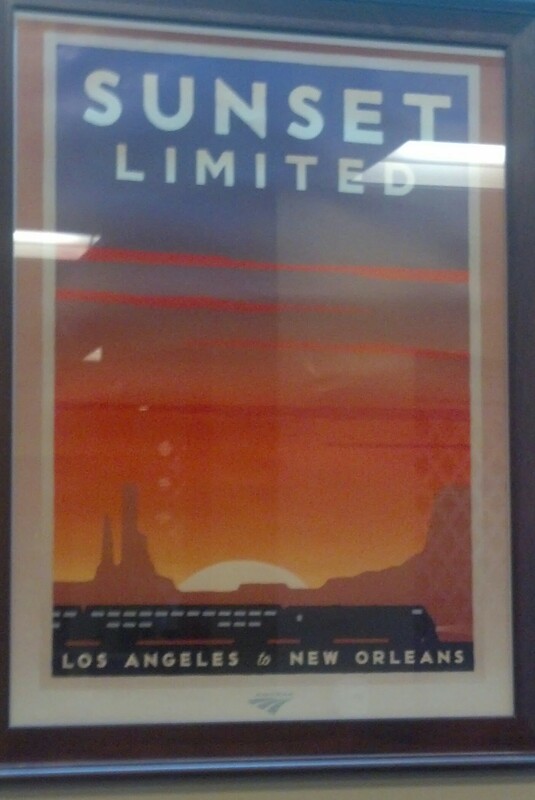 Then it was back to Union Station Los Angeles for our next train, the Sunset Limited. Five states were crossed as we headed back to New Orleans. We went through deserts with beautiful cactus and a scattering of cows and horses to green and verdant fields of crops. In a bit of kismet, we were able to connect with one of the folks from the conference who joined our train in Maricopa. Beth Burnett dashed down the length of the stopped train in El Paso to meet up with me and we were also able to share dinner with her before her portion of the train peeled off for a more northernly course that would eventually see her back home in Ohio. Because of flash flooding washing away some of the track, what was usually a two hour jog between San Antonio and Houston became a seven hour marathon as we were sent up north past Austin before dropping back to get into Houston nine hours late. We lost more time overnight and eventually got to New Orleans exactly twelve hours late at 9:30am on July 19th. As we had built padding into our schedule, we could just spend Saturday day resting and recovering. Traveling with my mom is great fun – she is endlessly curious and nobody remains a stranger long with her. We had great conversations with our constantly changing dining companions on the train and all those other smokers who would dash out of the train for the occasional breaks as we made our way across the country. The conference goers who met her became just more of her kids, too, and I was proud to share a bit more of my writerly life with her. Being able to see the country by train is also a marvelous experience. Sure, there are delays but most of those are because Amtrak doesn’t own the rails – the freight companies do and their loads take priority. The folks who work for Amtrak were really exemplary – our car attendants went above and beyond as did everyone else from customer service, baggage check, red caps, conductors, dining car stewards and attendants and the nice folks who staffed the desk at the Metropolitan Lounges across the country. We had packed books and our travel Scrabble game but the books only came out after dark. We spent the days mesmerized by the changing scenery. I’ve got some pictures up on Facebook, if anyone is interested in seeing them – Day 1 and 2, Day 3-4, Coast Starlight, Sunset Limited. I can’t express enough the fun that was had but I hope this post conveys some of the wonder that was my summer vacation. It was a magical night. Congratulations to all the winners! Next year will be in New Orleans and I hope to see y’all there!